If you’re a church leader or marketing professional, you understand the importance of marketing to any organization. It is how new families find your church or how new clients are exposed to your business. It may be the only way someone knows you exist. Not all marketing plans look the same and are generally specific for each industry or target market. For example, marketing plans geared toward attracting millennials will typically use internet driven marketing, while baby boomer-targeted marketing still heavily relies on printed media or television outlets. The means used is not necessarily an issue, but how the marketing is executed can be, especially marketing hot air. What do I mean by Marketing Hot Air? First, let me define the term. Marketing is the promotion, advertising, or communication in a favorable manner. The phrase hot air means boasting, bragging, nonsense, drivel, or even lies. 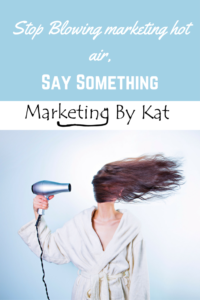 If you put these two things together, marketing hot air is to promote, advertise or communicate in a favorable manner through boasting, bragging or telling lies. Now that I have put that out there, why would any church, organization, or business want to blow marketing hot air? Simple, society has programmed us that this is the norm for marketing any brand, product, or entity, but there is a better way, God’s way. That might sound intimidating or even impossible to live up to, but it’s not. God is truthful, welcoming and offers each of us his grace and mercy. We just need to share that same attributes with those that we meet and market to. To start off my Stop Blowing Marketing Hot Air series, I wanted to start with the basics, with a foundation that we can build on in the coming weeks. We will start by looking at Jesus’ life and how he modeled honesty, integrity, and transparency. Understanding these aspects of Jesus’ character can allow one to follow his example and even lead others to follow him as well. Honesty is defined as the act of being honorable in principles, intentions, and actions; upright and fair. It is the act of telling the truth in words and in action. Jesus tells us to “sanctify them by the truth; your word is Truth” (John 17:17). Honesty means living by the Truth and the Truth is unwavering and unchanging. In fact, Truth is more than a characteristic, it is a person. Jesus is the truth that allows anyone to come to the Father. John 14 6 Jesus answered, “I am the way and the truth and the life. No one comes to the Father except through me.” By keeping honesty at your business’ core, your business can point to The Way and The Father. In fact, we are called to shine our lights on the Father through our actions. Matthew 5:16 Let your light so shine before men, that they may see your good works, and glorify your Father which is in heaven. How can we point to God with lies and dishonesty? Webster dictionary defines integrity as “adherence to moral and ethical principles; soundness of moral character; honesty.” When integrity is absent, it shows that one is fake, fraudulent and untrustworthy. Looking at Jesus’ life, we can see how he strictly adhered to his moral and ethical principles, even in the face of judgment, hate, and physical violence. We see how Jesus stood up for what he knew was right and just in the temple, even against leaders (Matthew 21). Jesus followed his convictions against societal norms by healing the “unclean” in Mark (Mark 1). If we give in to what this world deems as acceptable, we become conformed by its standards, instead of transforming this world by God’s standards. In fact, we are called resist being conformed by this world, and instead become transformed by the renewing of our minds through Christ and the Gospel (Romans 12:2). Churches and businesses that have a reputation of integrity in their daily operations and in their marketing build a lasting legacy that often surpasses their leadership tenor or even the organization’s lifespan. It is your job as a church leader or marketing professional to ensure your message is a lasting one. Making sure integrity is at the core of your church or organization is essential to following Christ. In the end, it may be the difference between a Christ-like marketing plan and a world-like one. Take the high road every time. It’s worth it. When we think of transparency, many of us think of a catchy slogan a government or organization throws out to sound honest. If we truly look at being transparent, we can see that it is more than words. It is a daily and consistent action. Transparency, by definition, is the act of being open, frank and candid. In other words, being transparent is allowing others to see the intentions and motivations behind your words and actions. Although being transparent can (and probably will) cost your company or church some popularity votes, it is critical to a marketing plan centered on Christ. By keeping your intentions clear and your message honest and open, your church or company can stop blowing marketing hot air.